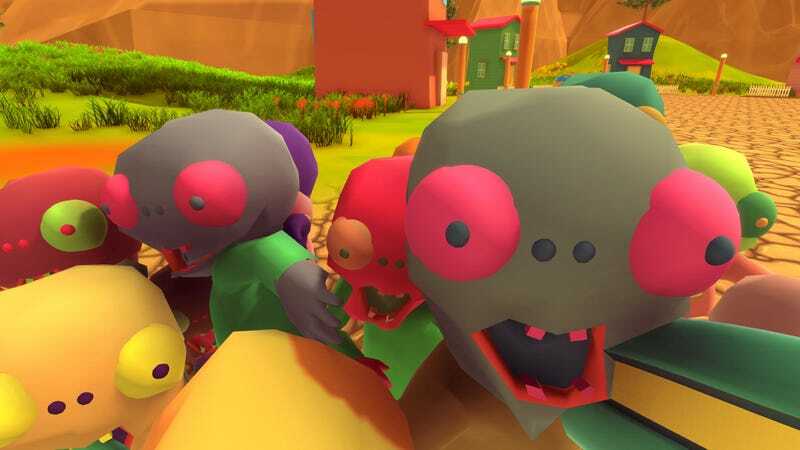 You are being swarmed by adorable zombies. You are probably going to die, but you will at least die fulfilled. Have you ever seen a zombie and thought, “Look at those squishy rotting cheeks. I just want to pinch them!” Well you’re in luck, because in Raise the Dead, you can keep adorable (but vicious) zombies and perform experiments with them. In this open-world PC game, you play as a survivor of a zombie-infested world whose goal is to find a cure. You can perform experiments on zombies in your lab at your home base, and you can also explore other areas of the world, such as a town, a cave where you can mine useful materials, and an island. There are a few different types of zombies in this game, such as werewolves and mummies, which differ by appearance. It’s a lot like Slime Rancher, only slightly more violent, and the creatures that you herd don’t eat their own excrement. Different types of zombies floating in research pods. The one on the far left is a mummy, which is described as a zombie wrapped in toilet paper. You have a gun which can be used to kill zombies either by zapping them with an electrical shock or shooting them with a laser beam. Your gun can also scan a zombie for its specs, such as its name, age and weight, and you can also use the gun to teleport dead zombies into storage. Once you kill a zombie and teleport it into storage, you can put it in a research pod. Doing this will allow you to earn research time, which can be used to develop new tech or unlock new information about zombies. From my playthrough of the alpha, it seems like this feature isn’t entirely functioning yet. Even though I earned research time after placing a couple of zombies in a chamber, upgrades and new information didn’t unlock. In the game’s current state, there’s still lots to do, though. In your lab, you can develop potions and new tech. Using materials you gather in your lab or in other environments, you can create new potions in the potion synthesizer. The game gives you a variety of potions that you can throw at zombies to see how it affects them. For example, the coloring potion will change the zombie to a different color, and the cloning potion will clone a zombie. But some of the results can be wackier or more interesting, depending on the kind of potion. Love potions will even let you breed zombies, and revive potions let you bring dead zombies back to life. Exploder potions will create a small blast which can instantly kill zombies. You can also sell potions to make money, which can use to do things like buy farms to grow crops, which can be used to produce different types of potions. While some of the mechanics are confusing right now and don’t seem to be entirely implemented since it’s in an early state of development, Raise the Dead has some interesting things going on. There are a lot of different things to interact with in the lab and some different types of experiments that you can perform. I had the most fun running away from zombies, or chasing them down and zapping them with my gun. I didn’t know what certain potions would do to zombies at first, so it was a lot of fun to use them on my research subjects and see what happened. I’m interested in seeing how this game will develop as time goes on, and what lore you can discover in future versions. A herd of zombies cluster around you in the town. Currently, the game is only available as what the developer describes as a “super early alpha,” which you can download on itch.io. According to the game’s webpage on Steam, the release date is listed as 2017-2018.